This chef's bundle is THE BOMB--cut those bagels, baby! Perfect for a starter cook or seasoned chef, it contains bagel knives no kitchen should be without. Enjoy 6 serrated plastic bagel knives in fun colors. Keep all 3 in their own box or wrap separately for individual gifts. Three come in a single box and are approximately 11" long. These make the perfect kitchen accessory for this season, for any season! Order now. This chef's bundle is THE BOMB--cut those bagels, baby! Perfect for a starter cook or seasoned chef, it contains bagel knives no kitchen should be without. 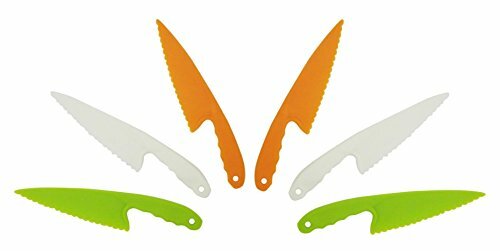 Enjoy 6 serrated plastic bagel knives in fun colors. Keep all 3 in their own box or wrap separately for individual gifts. Three come in a single box and are approximately 11" long. These make the perfect kitchen accessory for this season, for any season! If you have any questions about this product by JCCentral, contact us by completing and submitting the form below. If you are looking for a specif part number, please include it with your message.